Unless you're a sailor, you may not know what the spike blade of this knife is actually for. Myerchin knives like the Offshore Crew Pro are finding increasing use even away from the water, as truckers and climbers and other people who work with cargo straps and rope rediscover this modern version of an old sailor's standby. 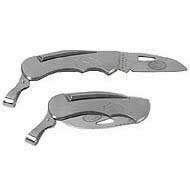 The A377P all-stainless-steel knife is manufactured for just that -- working with rigging. Even the serrations on the 2.25-inch 440C high carbon stainless steel blade were specially designed for that task, not just created to look impressive. The 2.4-inch marlinspike is for the opposite chore -- used properly, this stout steel spike can penetrate and unravel the tightest knots, saving valuable rope from the knife's edge. Before you choose an ultra-lite knife for the trail, consider this durable 4-1/2 ounce knife and its unusual features. Myerchin's Offshore Crew Pro locks back both blades, either individually or as a handy pair. The knife includes a lanyard clip that doubles as a lock release so you can add a wrist loop or a safety line. The smooth steel build has a sensible grip and finger choil built-in, and the spine of the knife blade places a jimped section in easy reach of your thumb for better traction and control. The blades are built for two-handed opening but respond well to the clumsy touch of fingers numbed by the cold. Everything's big enough to grip on a bad day. In 1984, when Myerchin Inc. began making sailing and rigging knives, their customers were mainly professional sailors from the Coast Guard and Navy. Based in southern California, Myerchin received plenty of advice and requests from knowledgeable customers and developed a well-rounded product line which today combines traditional rigging knife concepts with new materials and ideas.